This book is one I kept changing my mind about as I was reading. One moment I enjoyed it, the next I wasn't so sure. But overall, I have decided to give it four stars (three and half). The storyline is interesting and while not 100% original, is still something that hasn't been done for a while and then more in TV shows than books. I liked the characters on the whole, but the one issue I had was that they sometimes felt too 'adult': doing and saying things that seemed wrong for their age. The book was well paced with plenty of action and it was a nice easy read: a book you could chill out with without needing to put too much thought into it. I finished the book still keen to know what would happen next and so I would be happy to read on in the series once the second book comes out. 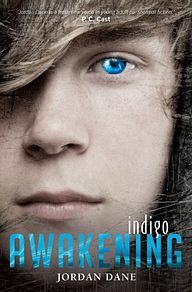 I would say that this is worth your time if you are a big fan of YA paranormal/fantasy. It may not be the best example out there, but it is still a very good read. My thanks to Harlequin Australia for the review copy.